World premiere of The Flying Stars by Ngardy Conteh George and Allan Tong at the Rencontres Internationales du documentaire de Montréal | Montreal International Film Festival. Screenings: 14 November and 16 November. 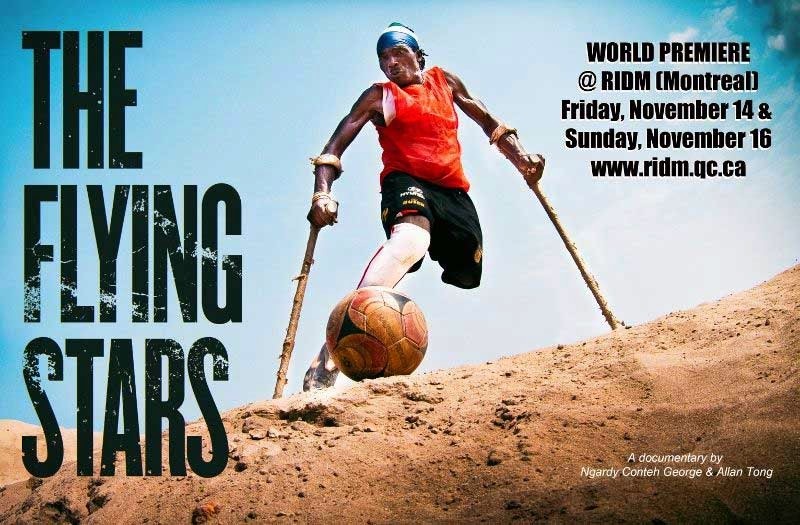 The Flying Stars is about amputee soccer in post-war Sierra Leone. Team captain Bornor Kargbo and midfielder Momahamed “Census” Jalloh are amputees who play organized soccer in Sierra Leone to cope with the horrors of war they suffered a decade ago. As they dream of playing internationally, they wrestle with nightmares that haunt their daily lives and threaten the very families they are trying to feed. Can Bornor and Census overcome their postwar trauma and score a victory for their children off the soccer pitch? As a Sierra Leonean-Canadian, Ngardy always wants to tell stories of the African Diaspora. As a director she has achieved this with Soldiers for the Streets, a short documentary for the NFB, broadcast on CBC Television and Literature Alive, a documentary series featuring Caribbean- Canadian authors broadcast on Bravo!. She is also an accomplished video editor working on various documentaries and television shows including I Want to Be a Desi 2 (documentary short, Dir. Allan Tong), Something Beautiful (half-hour documentary on development in Kenya), Cypher for AUX TV, Arts & Minds for Bravo!, The Rhyming Chef Barbuda, Food & Drink TV and The Marilyn Denis Show for CTV. She is a former scholarship athlete and graduate of the University of New Orleans. Allan is a Toronto filmmaker who wrote and directed the comedy shorts Little Mao and I Want To Be a Desi, which Bravo aired after enjoying award-winning festival runs. His short drama, Grange Avenue (2008) also played festivals and was broadcast on the Canadian Broadcasting Corporation. Previously, Allan apprenticed as a documentary director and producer at the National Film Board of Canada. He has served as an office manager, post-production manager and associate producer at documentary production companies. His articles about cinema regularly appear in the IFP’s Filmmaker magazine, and he has programmed for several film festivals. Presently, Allan is writing scripted television drama after recently completing the WGC-Bell Media Diverse Screenwriters Program.